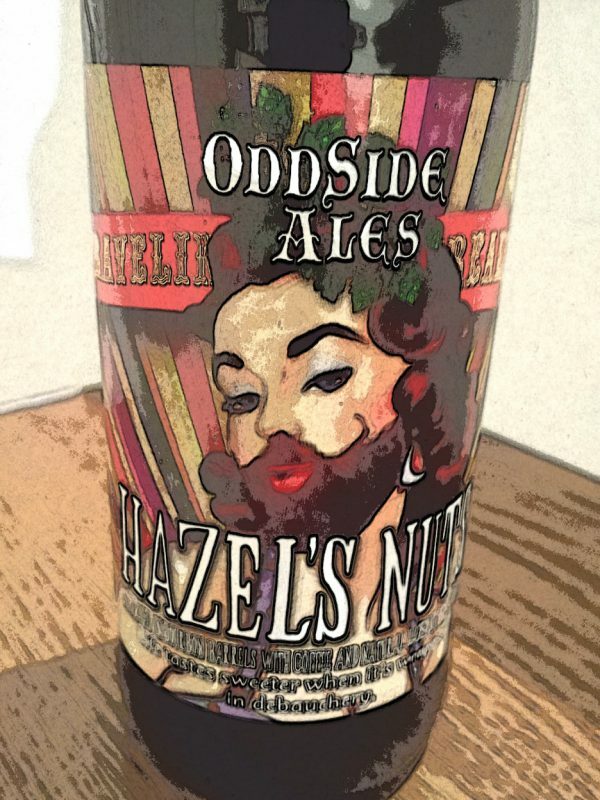 Hazel’s Nuts Bourbon Barrel Aged Stout with Hazelnut Flavoring by Oddside Ales Don't get run over by a two-foot tall woman. First of all, forget any clown phobia. I love clowns. Rather the side-show acts are my undoing. Not so much that the oddities cause me fear but rather the sense of exploitation and pity are so depressing. I had hoped that a lot of it was fake yet I came face to face with reality a few years ago. It was almost closing time at the Meadowland’s Fair and a fast charging electric wheelchair was barreling down right at me. As it got closer, I realized that the driver was probably less than two feet tall. She almost ran me over. She was real and she nearly killed me. So, let’s get onto the beer. Love the label since it has that authentic carny sideshow poster feel. Like the tag line, “life is sweeter when it’s covered in debauchery.” I’ll also note that Hazel’s Nuts is formerly known as Ahh Nuts! when it was released as a draft only offering. This bottle was a bonus beer in a trade for some Trillium bottles last summer. This trader sent me some excellent bonus bottles. Holy hazelnut aroma! Wow! Smooth mouthfeel. Dominant hazel nut and bakers chocolate flavor. Nuttiness seems genuine and yet very complimentary. Seems like no barrel influence at all. Also, a tad hot on the finish yet it doesn’t hinder the experience. In conclusion, 93 points. Have one for dessert. What a fun beer. This entry was posted in All Beers, Ratings: 90 - 94, Style: Stout/Porter and tagged Ahh Nuts!, Annie Jones, Bearded Lady, Hazel's Nuts, Oddside Ales, PT Barnum by Administrator. Bookmark the permalink.